Darth Vader, the Empire’s evil enforcer, the dark lord of the Sith, and Luke Skywalker’s father, by his looming figure has made many a viewer shudder in their seat. His eerie breath has produced goose bumps and made the hair stand on end. His evil power is unmatched and feared by all. Without any doubt, Darth Vader is the greatest screen villain to have ever been created. The iconic movie villain inspired Dov Kelemer and Sarah Jo Marks, curators of DKE Toys, to conceptualize ‘The Vader Project’. 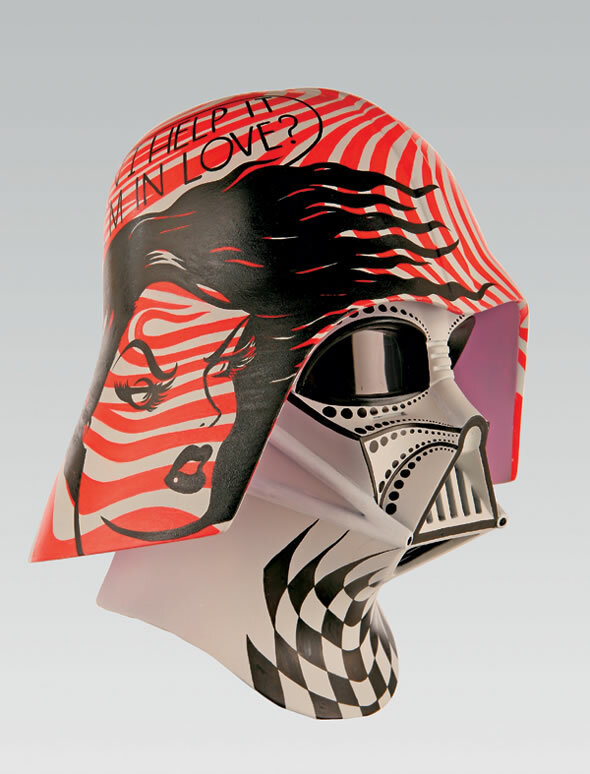 The Vader Project allows the hottest underground and pop surrealist artists to re-imagine the Darth Vader helmet in their personal, eclectic style. The artists are given a 1:1 authentic prop replica of the helmet. 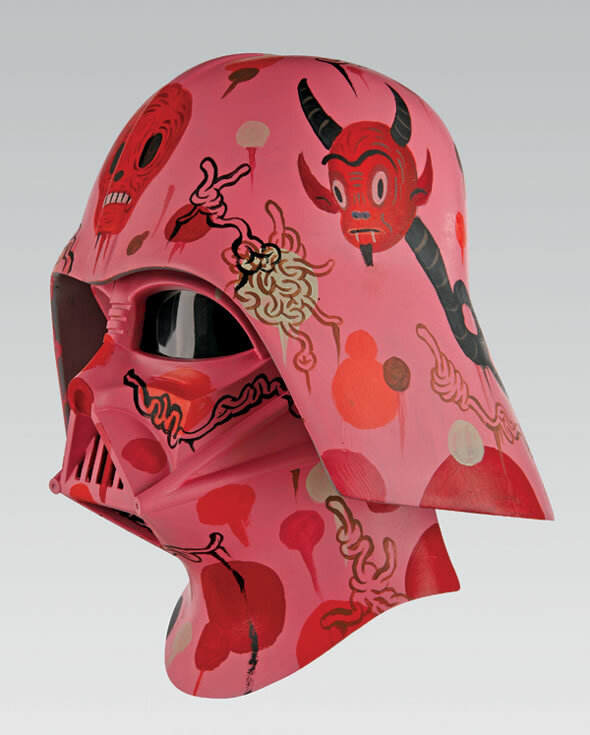 Artists use these helmets as a blank canvas to express their particular take on the dark lord. 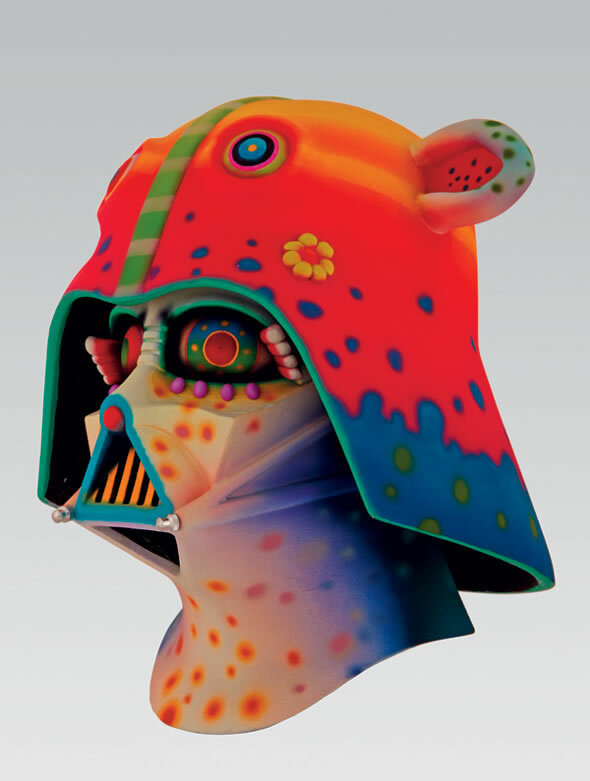 The original idea for the project occurred to Kelemer and Marks in 2005, and the first exhibition of the truly imaginative Vader helmets took place in 2007. Since then, it has gone around the world and has attracted a huge number of fans and visitors. An interesting aspect of this project is that every year a whole new bunch of artists are invited to paint, design, and re-invent the Vader helmet. Like every year, 2010 has a fresh batch of underground artists designing the helmet of the Dark Lord. The helmet designs this year are colorful, extremely imaginative, and bold on design. 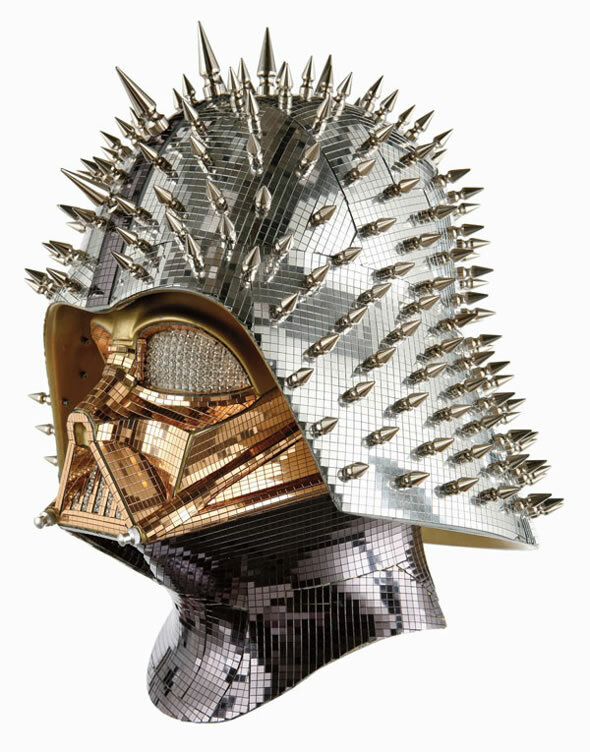 A Darth Vader helmet has a disco look to it with the visage covered by mirrored glass and pointed studs. Another helmet features a psychedelic design with flowers, the hippie peace symbol, and rainbow colors mashed up against a dark background. 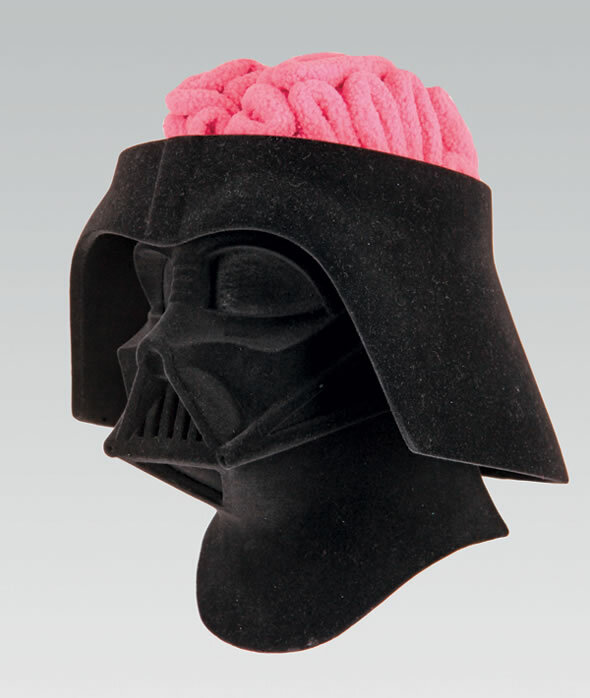 If you are into psychoanalysis, then the following design will surely interest you: a Vader helmet covered in black velvet material, with the top third cut off, and pink brains on display. There are also helmets that feature anime design and feminist art. However, my personal favorite is a 70’s military styled helmet, which has a camouflage cover and a Marlboro cigarette packet fastened to the helmet by a black elastic band. 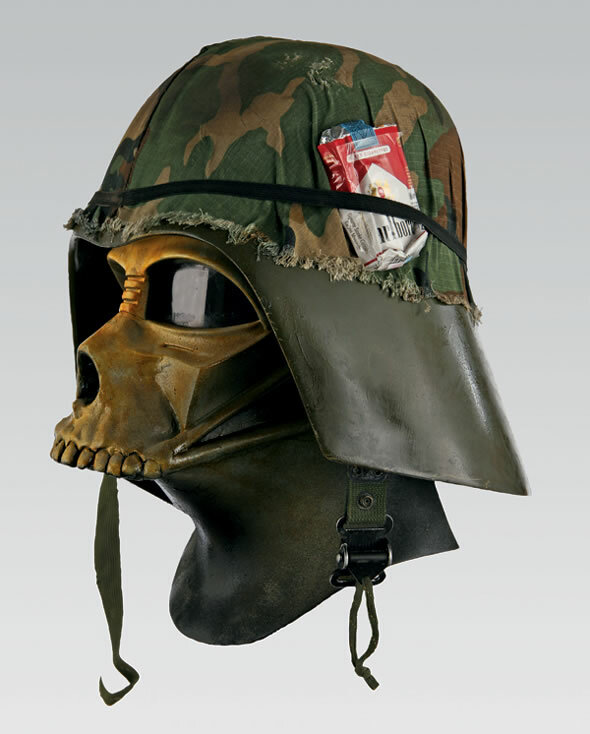 The standout feature of this design is the skull impression as the face of the helmet: A comment on the futility of war. This year’s roster of artists includes the hotshots of the underground art movement such as Gary Baseman, Tim Biskup, Jeff Soto, Wade Lageose, Mister Cartoon, just to name a few. The Vader Project returns to Hollywood in June this year for a special ten-day preview exhibition. 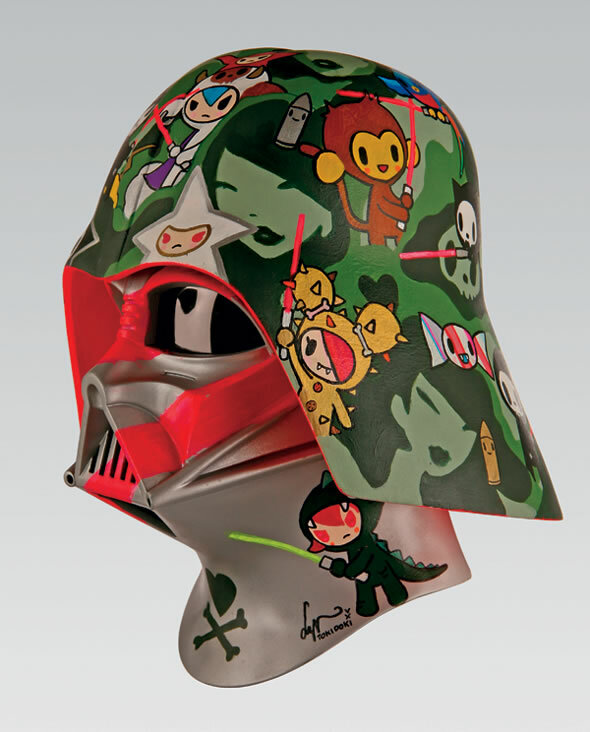 Do not miss out on this opportunity to take a look at the visually stunning Vader helmets. You can also take a look at Iron Man Helmet and Star Wars Helmet to know more about such cool and trendy helmets.